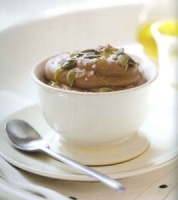 This yummy chocolate treat from Marisa Churchill's cookbook Sweet & Skinny won't ruin your diet! Combine the chocolate chips and 2 teaspoons water in a double boiler, or in a bowl in a microwave oven, and heat until you can stir the mixture smooth. Put the whipped topping into a medium bowl and whisk in the melted chocolate until the mixture is smooth. Whisk in the cocoa, cinnamon, and cayenne until they are well combined. To serve: Divide the mousse between two serving glasses and top with the pepitas. Drizzle the olive oil over the tops, and sprinkle with a small pinch of sea salt.